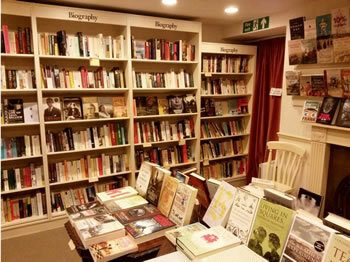 Having recently learnt about an independent bookshop nearby, called Mr B’s Emporium of Reading Delights, we knew we had to go. So we set off to Bath in search of the shop. 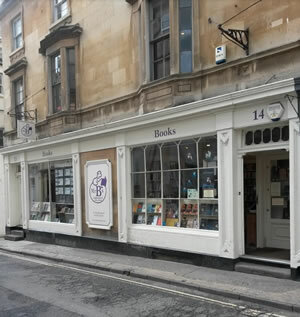 The quiet back streets of Bath make a perfect location for a quiet, peaceful bookshop. It does however make it difficult to find, if you are not familiar with this part of Bath. 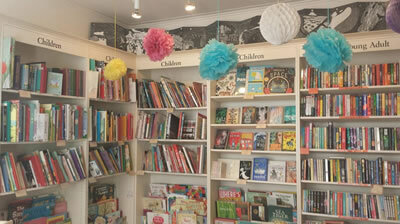 Entering the bookshop, we began to peruse the many shelves of books. The children’s section with its sweet, dolls house shaped bookshelf, the collections of themed shelves, from art and design to travel books. 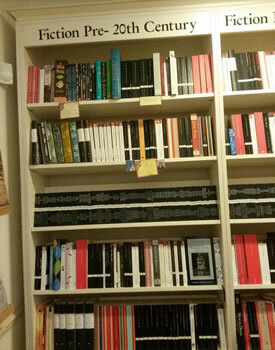 My favourite shelf of books, by far was the wall of penguin classics. Lined up side by side like an army of literary loveliness, waiting to be read. The amazing décor of the shop also added to the uniqueness of the establishment. Tin Tin comic pages plastered the wall, as you head up the stairs. 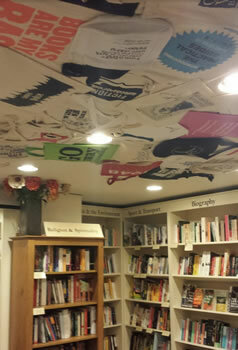 Reading merchandise and quotes cover the ceiling of the downstairs area. Even the toilets are decorated with book themes. After wandering around the shop for over an hour (and I definitely could have spent longer in there), we were already holding books to buy. 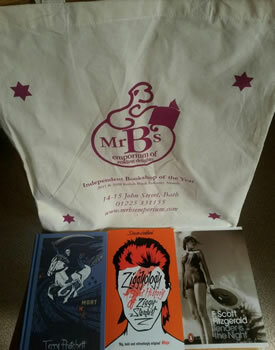 My mother, a fan of David Bowie picked up ‘Ziggyology, A Brief History of Ziggy Stardust’, as well as a book for my brother’s 16th birthday, ‘Mort’ by Terry Pratchett. Me, loving F. Scott Fitzgerald’s, ‘The Great Gatsby’ and wanting to read more of his work, had picked up his novel, The Last Tycoon, after some umming and erring over which to pick. Whilst we cast our eyes over the last display in the shop, a member of staff overhearing our conversation about another book, joined in and began recommending one of his new favourite books, ‘The Missing’, by Tim Gautreaux. A lengthy discussion about great new books then followed, before we asked him advice about the book for my brother’s birthday. We wanted to buy something by Terry Pratchett for my brother, who had never read any of his books. The staff member agreed that Mort was a good place to start because not only is it a stand-alone book that doesn’t need to be read as part of a series, but it also features a 16 year old boy, who my brother would be able to relate to. Upon noticing the Fitzgerald book in my hand, I was asked which of his books I had already read. This led to a discussion with another member of staff behind the till, who suggested that after reading The Great Gatsby, Tender is the Night, would be better to follow than The Last Tycoon which I was currently holding. This piece of advice is what I love about bookshops and in particular independent ones. It was a great help in aiding my decision, after I had struggled indecisively over the books, eventually leading me to randomly pick one. Swapping The Last Tycoon, for Tender is the Night we headed to the till, adding Mr B’s canvas bags to the pile of shopping, we paid (the only painful part of the visit), slid the books carefully into the bags and left the shop. Leaving the shop, I already couldn’t wait to go back again. 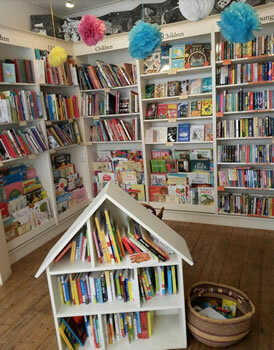 Full details and contact information for Mr B’s Emporium of Bookish Delights here.